eScreen is designed and manufactured by Intersurface Dynamics, a company that makes application specific chemicals for the semiconductor industry. Although you probably have never heard of us, you should know that many of the items in your home today function because of what we do. Personal Computers, Cell Phones, GPS systems, LCD/Plasma and DLP TV’s, LED lighting, PV cells found in Solar Panels, Low-E windows are just a few of the products used by today’s consumer that have been touched by an Intersurface Dynamics product somewhere in the manufacturing process. One of the areas Intersurface Dynamics specializes in is aqueous based specialty surfactants and detergents. These high-tech cleaning products are manufactured in our ISO-9001 certified design and production facility located Connecticut, USA. The same practices that have surpassed industry benchmarks have been used in designing and manufacturing eScreen. Tested on all modern surfaces found in the home, school and office eScreen has been approved by many of the world’s leading producers of high tech consumer electronics to assure that the surface is streak free, clean and importantly, won’t damage the viewing surface. 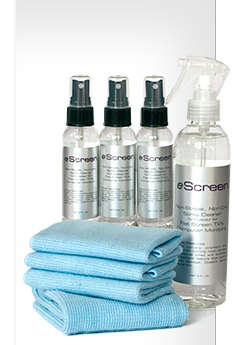 Unlike other products which claim performance but are merely accessory items private labeled by cable makers, TV makers, etc., (and made overseas for the lowest cost) eScreen is designed and manufactured in the USA by the industry leader in supplying chemistry for high technology industries.